This is the first time I’ve ever read a novel tie-in to a show or movie. My opinion has always been that books can become movies but movies shouldn’t become books. You have to add in so much information for a TV novelization to be a good book. When I read a book, I’m not just looking for a story, I’m looking for beauty. For art. For characterization. These are things that this book did not particularly have. You knew who the characters were, after all. Why develop them? You knew about the world in which this story was taking place. No need for world building. So, in that way, the book isn’t what I’m generally looking for in a book. That said, this book did have humor, excitement, and familiar friends going through wild adventures. It was Doctor Who, after all, how could I not like it? 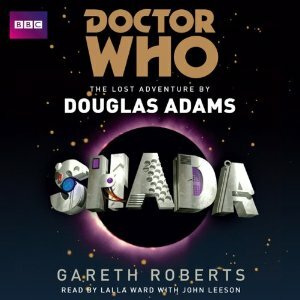 The book was well-read – narrated by the actress who played Romana in the TV show. K-9’s voice was John Leeson, as well. So that was a very nice touch. This is my first time listening to a dramatization with sound effects. I’ve heard multiple-reader dramatizations, but never with footsteps, creaking doors, etc. It was kind of fun. Maybe I’ll try something like this out again. I’m going to have to give this book 3.5 snowflakes because I prefer books that have more characterization and world-building. But I also recognize that this is not what tv novelizations are meant to have. I have the same feeling that you do when it comes to these books that are based on television shows and films. I also look for the same thing as you do when reading books. Years ago I read a few Star Trek tie in novels. Though I enjoyed them at the time I think that there are so many books out there that time is better spent on. With that, I really like Doctor Who, both Classic and newer. Yeah, I love both classic and new Doctor Who. I've been watching them all slowly but surely with my bff and nephew.